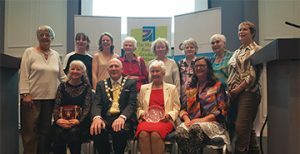 A homework club operated by St Vincent de Paul ‘Croí na Gaillimhe’ (‘Heart of Galway’) volunteers for youngsters at a hostel for asylum seekers in Salthill has won a Children and Youth Support Award from the Mayor of Galway Cllr Noel Larkin. About 20 St Vincent de Paul (SVP) volunteers take it in turns to help children living at the Eglinton Direct Provision Centre in Salthill with their homework. Many of these children would not have English as their first language, and all of them, as asylum seekers, have had to abandon their native homelands and are living in temporary accommodation until their asylum applications are approved. The majority of the children attending the club, which runs from 2.30 pm to 6.30 pm Monday to Thursday, are in primary school, but there are also secondary school children attending. The club also benefits the children’s parents, because it gives them opportunities to enter into dialogue about their families’ futures and to learn about ways they might tackle the problems they face. The club was started in September 2014 and has been funded by the Maureen O’Connell bequest. It is also supported by the Croí na Gaillimhe Resource Centre in Mill Street. Maureen O’Connell, the former owner of a large public house in the city centre, had nominated the SVP as the main beneficiary in her will. The volunteers, most of whom belong to the Christ the King SVP Conference, are dedicated and committed, and share their time, expertise, talents and experience on a daily basis, said the Society’s spokesperson Jim Walsh. “Some are retired teachers, which gives the service an intergenerational aspect, while our younger volunteers serve as good role models. The volunteers are experienced in working with children, assisting them with their educational needs.